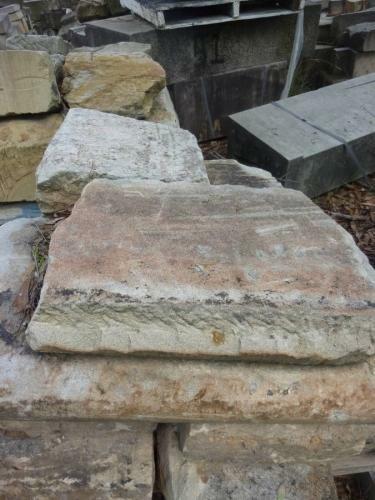 We source reclaimed paving, wall capping, step treads, wall blocks and interesting architectural stone elements, throughout Australia. The material is sourced from old buildings and historic sites that are under repair or renovations. The material is well worn and aged and includes a range of finishes including chisel and sparrow picked.The material varies greatly in size from large slabs and blocks to smaller pieces. We can also supply antiqued and aged sandstone in a range of sizes and thicknesses. This is bush hammered and distressed to provide a finish that closely resembles the reclaimed material.